Home / brand new / brand new artist / música / VIKINGO! / VIKINGO! 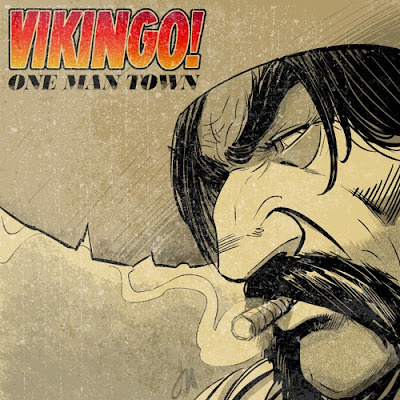 Unveil Debut Single "One Man Town"
VIKINGO! Unveil Debut Single "One Man Town"
Let's rock everybody! Rock band VIKINGO! have just released their debut single, One Man Town. I am loving this guitar heavy track guys! The song has killer drumming accompanied by thrashing guitar and bass. Stream this gem below! One Man Town was recorded at the famed 4th Street Recording (Muse, The Beach Boys, Bad Suns) and was mastered by Dale Becker (Macklemore, Neil Diamond). We are all studio nerds who get excited about microphones and boxes that do magical things to sounds. This is a song about being stubborn. It's about proudly sticking to your guns and shooting down anyone who gets in your way. It's about that moment you realize you've burned all your bridges and you end up carrying the weight of the world on your shoulders. You end up living in a one-man-town. Comprised of Daniel Jimenez Afanador on lead vocals and guitar, Sejo Navajas on guitar, Andreas Kvinge Sandnes on bass, and Chris Roberts on drums, VIKINGO! formed last year. At age fourteen, childhood best friends Jimenez Afanador and Navajas performed in a band together in Colombia. They later moved to the United States and began to grow their careers separately. With their successes as producers within the music industry, Navajas and Jimenez Afanador decided it was time to start a band again. Navajas suggested his friend, Sandnes who he met at 4th Street Recording, the studio that Navajas is not only a partner at, but also the chief engineer. He then invited past bandmate and 4th Street studio drummer, Roberts, to join and VIKINGO! was formed.